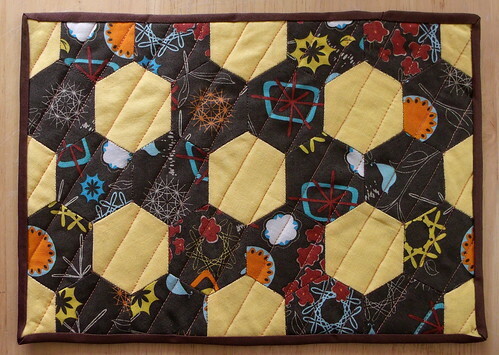 I thought it’d take more than one evening to stitch the binding on the hexagon mug rug since I’d never done it before, but it went much faster than I expected. I feel pretty much ready to tackle the miles of binding on the quilt once I get it to that point. No particular tutorial — I read a few different ones to get a general idea of what size would be good, then did my own thing with the English paper piecing. I haven’t picked up a walking foot for my machine yet, but I pinned it within an inch of its life, and it’s small enough that I didn’t have any trouble with the layers shifting. I just did straight diagonal lines about 3/4″ apart. I goofed buying bias tape, picked up a package of single fold instead of double fold, making the binding end up half the width I’d intended. I don’t really have any clue what you’re supposed to do with single fold bias tape, so I folded it in half and used it the same way as double fold. The narrow binding made it a bit tricky to attach, and between that and it being my first go at hand-stitching binding it’s a little wobbly in places, especially a couple of the corners and the place where it overlaps. 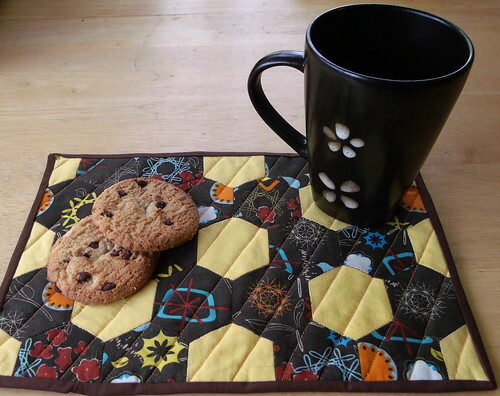 I plan to make my own binding for the quilt, so it won’t be subject shopping mishaps at least. I learned a lot doing it. And it’s so cheery — it’s making me very happy on a gloomy, blustery, where-did-spring-go? sort of day.